Military investigators from Russia stand near the debris of a Russian airliner at the site of its crash at the Hassana area in Arish city, north Egypt, Nov. 1, 2015. As investigators search through black box data and wreckage for what caused the crash of Russia's Metrojet flight 9268 over Egypt's Sinai Peninsula, experts say Russia needs to do more to address systemic problems with the country's air safety record. While the airline, Metrojet, has dismissed suggestions that a pilot or technical error could have caused the Airbus A321 to fall from the sky just minutes after reaching cruising altitude, Russian authorities are keeping all possibilities on the table, including terrorism. Vadim Lukashevich, an independent expert on Russia's air safety and aerospace industry, believed a technical problem was most likely. 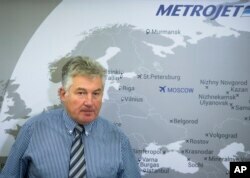 Alexander Smirnov, the deputy general director of Metrojett, the Russian airline company speaks to the media about their plane, which crashed Saturday in Egypt's Sinai Peninsula, in Moscow, Russia, Nov. 2, 2015. Metrojet’s deputy director , speaking in Moscow Monday, said fluctuations in the plane’s altitude and speed may indicate the pilots struggled to control the aircraft. Lukashevich is an outspoken critic of Russia's aerospace policies and said, for that reason, he was fired from his position at a state-run research center earlier this year. Portraits of two plane crash victims Natalia Soldatulina and Alexandra Pilip are placed near flowers and toys at an entrance of Pulkovo airport outside St. Petersburg, Russia, Nov. 4, 2015. Lukashevich said these factors were why air safety in Russia, as part of the Commonwealth of Independent States (CIS), was much worse than the global average. According to the International Air Transport Association (IATA), the CIS had the worst performance among regions of the world from 2009-2013. The CIS air safety record has shown strong improvement in more recent years. The jet hull loss rate, a measure of damage beyond repair per million departures, dropped to 0.83 in 2014 from the five-year rate of 2.74. CIS airlines under the IATA's Operational Safety Audit (IOSA) registry, which seeks to bring airlines up to global standards, had zero accidents in 2013 and 2014. But while a number of Russia's larger airlines, including state carrier Aeroflot, are on the IOSA list, many smaller companies, such as Metrojet's Kogalymavia, are not. Lukashevich said talk among some Russian politicians of forcing small companies to merge into larger ones misses the point. He said Russia needed to centralize all bodies dealing with air safety and better enforce standards across the board. Trucks carry the bodies of the air crash victims from a city morgue to the crematorium for identification in St.Petersburg, Russia, Nov. 2, 2015. Russia's Interfax news agency on Monday quoted Minister of Justice Alexander Konovalov saying it was premature to talk about tightening Russia's air safety laws until the cause of the crash is known. The tragic death of all 224 people on board the Metrojet flight returning from Egypt's Sharm el-Sheikh resort area to St. Petersburg has raised some calls for greater air safety in Russia. "Unfortunately, we raise the problem of air safety after a tragedy, after people die," said Lukashevich. "We talk a lot about it, and beautifully, but after a while the words are forgotten until the next air crash." Another deadly crash involving a Russian-built plane occurred Wednesday in South Sudan.